Spray 6-quart Instant Pot™ insert with cooking spray. Season ribs with seasoning and salt. Add broth to insert, and stand ribs up against sides of insert. Secure lid; set pressure valve to SEALING. Select MANUAL; cook on high pressure 15 minutes. Select CANCEL. Keep pressure valve in SEALING position to release pressure naturally. Transfer ribs to cutting board; cool slightly. Discard cooking liquid. When cool enough to handle, cut sections into individual ribs. Meanwhile, in 1-quart saucepan, mix ketchup, whiskey, honey, chili powder and onion powder. Heat to simmering over medium-high heat; reduce to medium, and cook uncovered 8 to 10 minutes, stirring frequently until thickened. Reserve. Position oven rack 4 inches from broiler element. Set oven control to broil. Line rimmed sheet pan with foil. Spray with cooking spray. 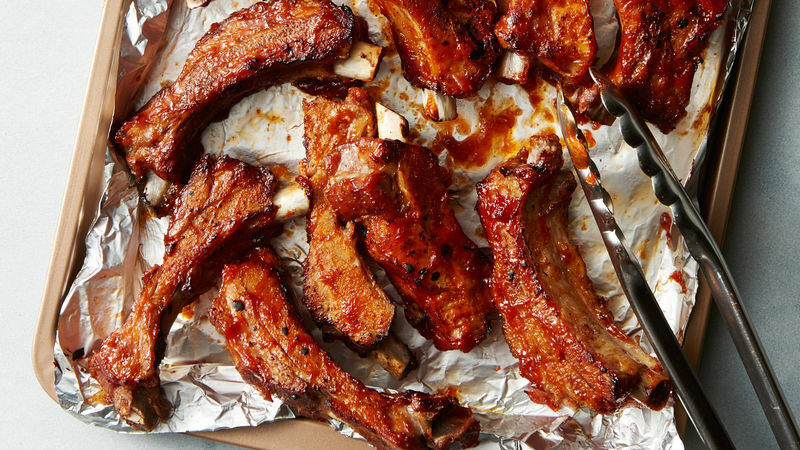 Place ribs on foil; brush all over with sauce. Broil ribs 2 to 4 minutes or until sticky, crispy and blackened in spots. No broiler? No problem. While broiling adds nice flavor and color, the ribs will still be delicious if you need to skip that step. Don’t substitute larger ribs for the baby back ribs. This recipe was designed for the smaller racks, and larger ribs will not get tender in the same amount of time.